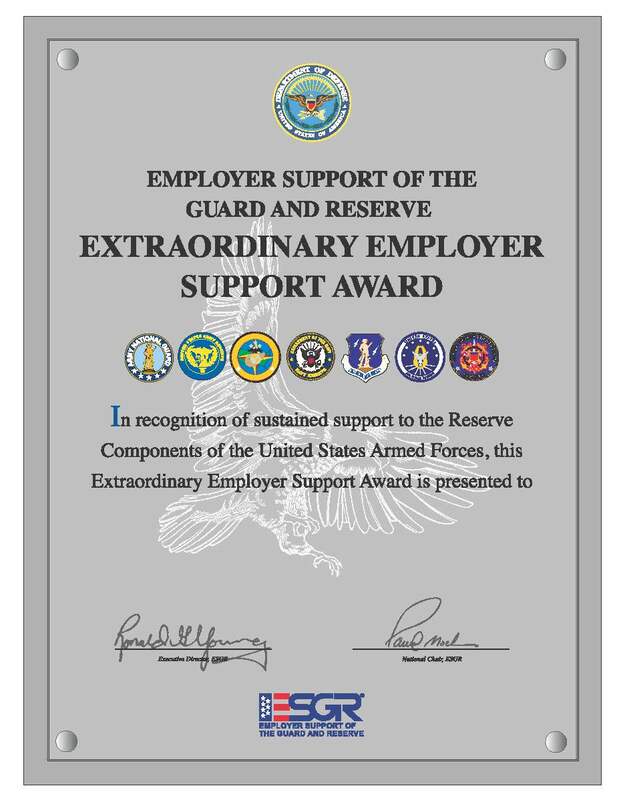 ESGR’s Extraordinary Employer Support Award was created to recognize sustained employer support of National Guard and Reserve service. Only prior recipients of the Secretary of Defense Employer Support Freedom Award or the Pro Patria Award, who have demonstrated sustained support for three years after receiving one of those awards, are eligible for consideration at the committee level. Subsequent awards may be given in three-year increments from the initial award. Recognizing supportive employers is vital to ESGR’s mission. ESGR’s 54 State Committees actively promote awards as a key element in furthering employer support, while strengthening relationships between Service members and employers. These Department of Defense awards honor the sacrifices made by so many employers year after year.